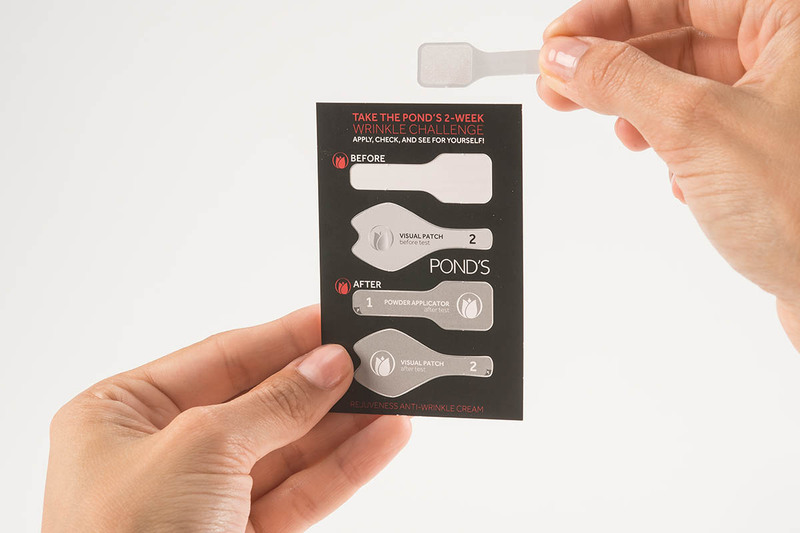 While planning the launch of their Rejuveness Wrinkle Cream the POND’s team searched for a solution to prove their product’s claim. In addition, they required the solution to engage consumers, whilst at the same time being functional in-store, via social media and TV-commercials. 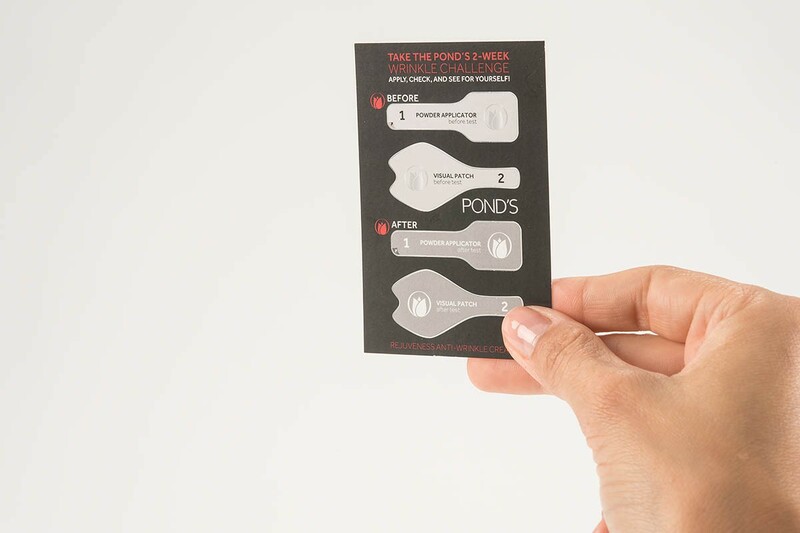 Whilst planning the launch of their Rejuveness Wrinkle Cream the POND’s team searched for a solution to prove their product’s claim. 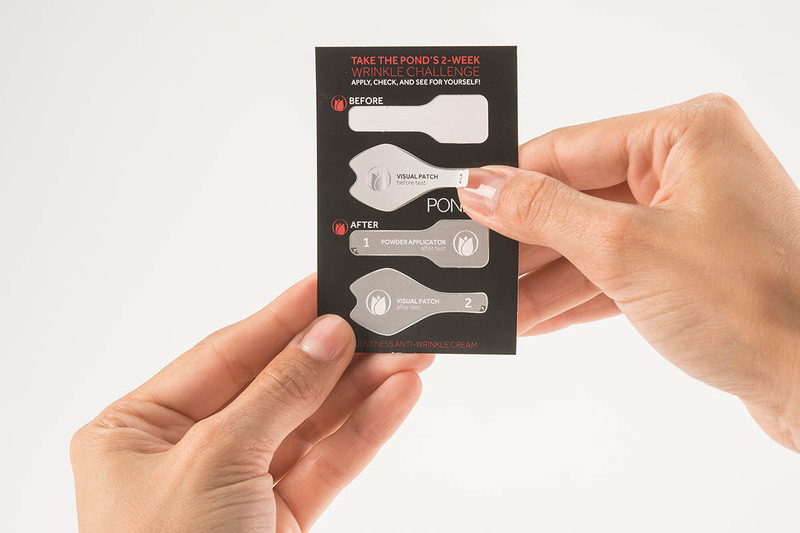 In addition, they required the solution to engage consumers whilst at the same time being functional in-store, via social media and TV-commercials. 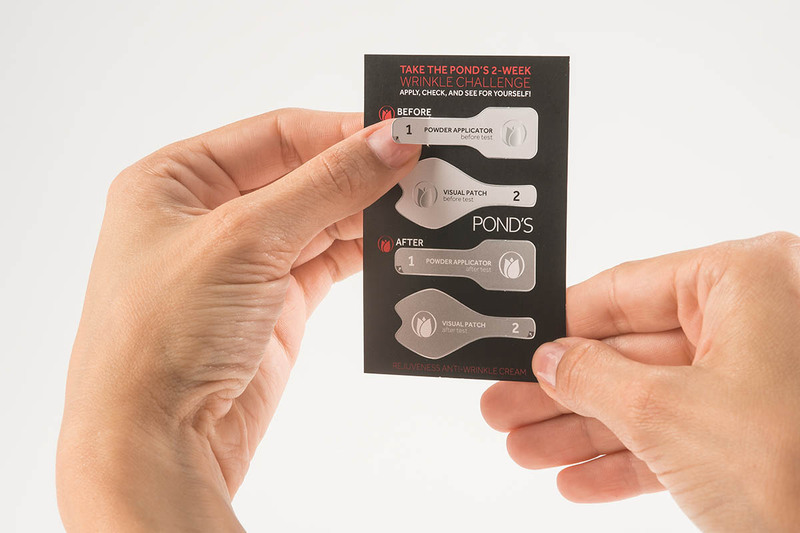 Our team of activation experts were excited to support POND’s by creating a highly engaging activation card – identifying the consumer’s need for the product and proving the product’s claim. 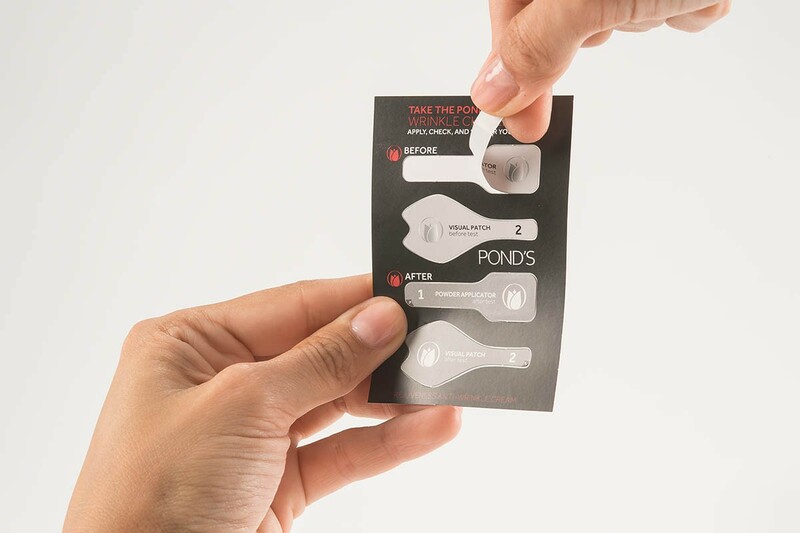 By integrating a haptic experience, the consumer got to touch and feel the brand, leading to brand awareness and trust. 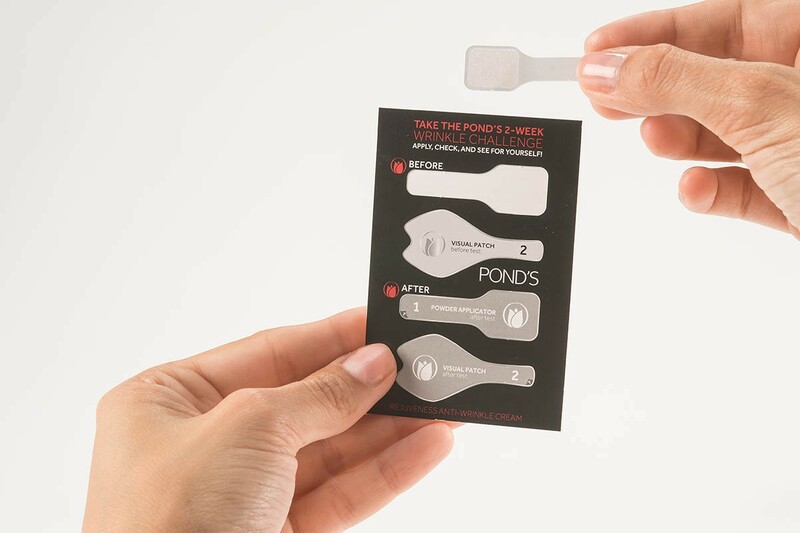 Since POND’s wanted to show consumers what effect their Wrinkle Cream had before and after two weeks of using it, USP suggested the 2D-Wrinkle Tester as the optimal technology option. 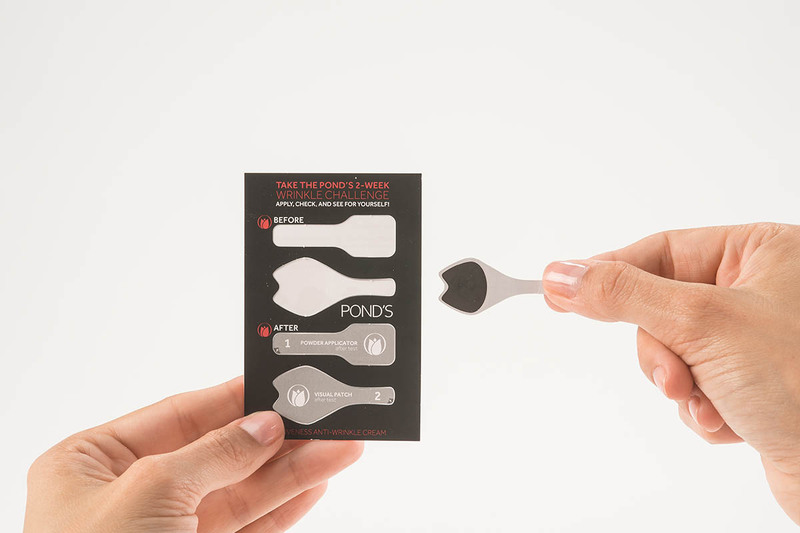 Several prototypes were then sent to the POND’s offices and evaluated in terms of shape and size. After POND’s selected technology type, card size and shape, USP Solutions handled artwork creation, printing and delivery. 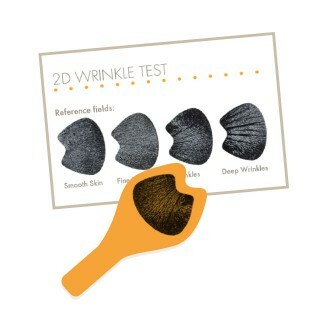 The 2-Dimensional Wrinkle Test gives consumers a moment of truth to understand their skin’s surface structure and signs of aging. 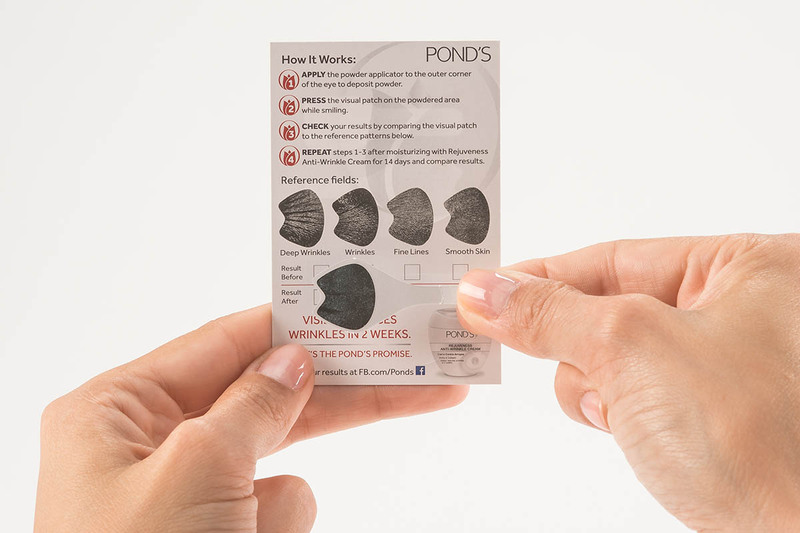 As a result, consumers realize their need for the POND’s Rejuveness Anti Wrinkle Cream. 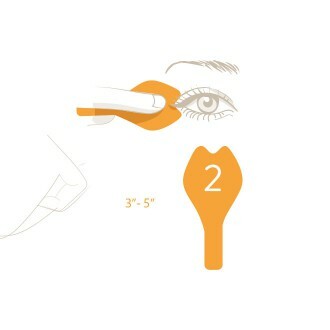 This wrinkle test consists of two parts: a Powder Applicator and a Visual Patch. 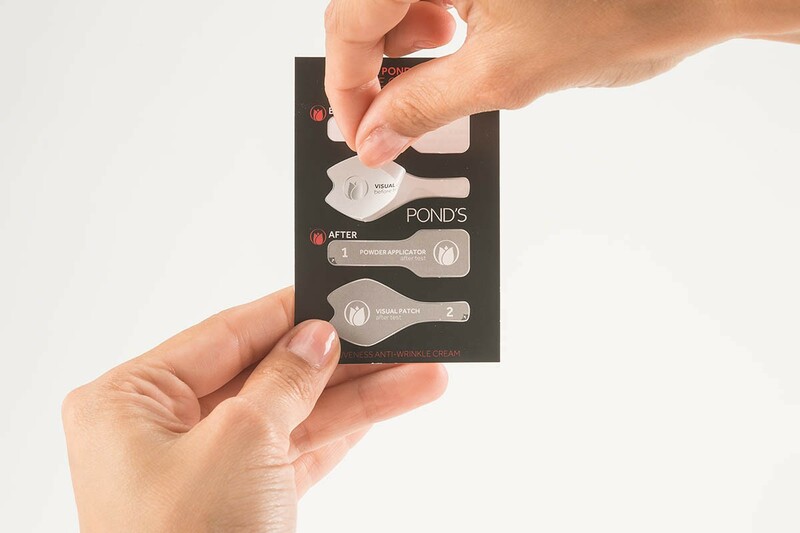 When used together, the strips deliver a 2-dimensional visualization of the skin’s surface structure and/or facial expression lines. 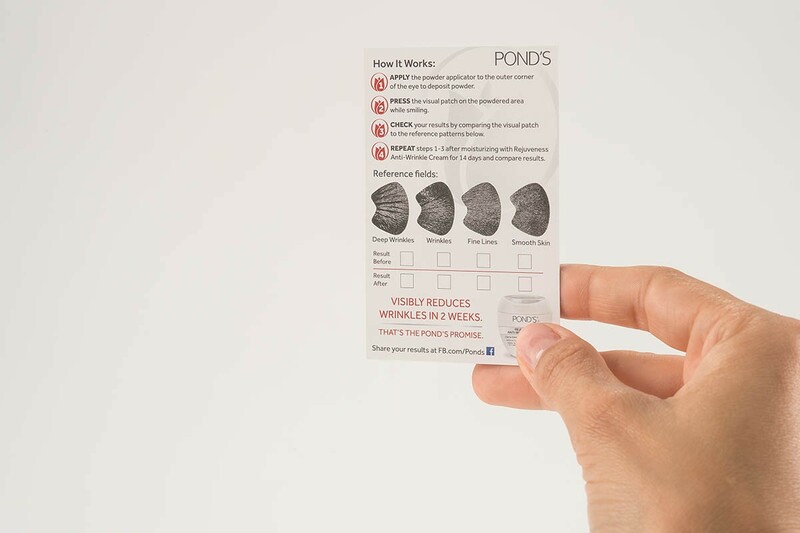 By taking one test before using POND’s Wrinkle Cream and another taken two weeks after having used the product, consumers learned about the efficacy of POND’s Anti Wrinkle Cream. Place the Visual Patch on top of the powdered skin area. Gently press visual patch on eye corner. Make sure the whole test area is placed on the skin – then remove. Compare test area with result fields and identify skin structure. Repeat test once having using POND’s Rejuveness Wrinkle Cream for 2 weeks. Compare the two test results and see how effectively the Wrinkle Cream has smoothed your skin’s surface. 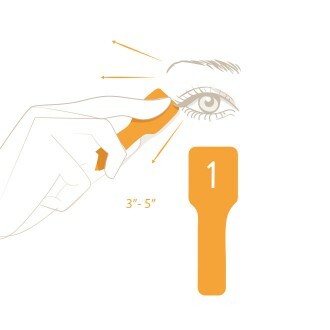 Apply powder by gently rubbing patch to skin at eye corner (patch 1). Press wrinkle patch onto eye area (patch 2). Compare wrinkle patch with result fields to determine your personal wrinkle structure.